Globus Disclaimer - Indicates that this departure and vacation is available for 2018 early booking. All tours will be open for 2018 bookings in the Fall of 2017. Vacation upgrades and/or additions will not be available for early booking, as well as, any extra pre- or post-night pricing until the Fall of 2017. With the exception of Journeys Club discounts, future travel promotions are not applicable and are not retroactive on early bookings. Offer reliant on space availability. Applies to new 2018 bookings only. Full cancellation penalties will apply. Additional restrictions may apply. NOTE: Intra-country airfare is required for this tour and is included in the prices below along with applicable air taxes. 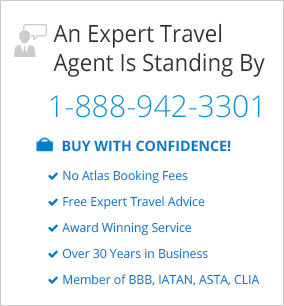 Please contact a travel agent for more information. 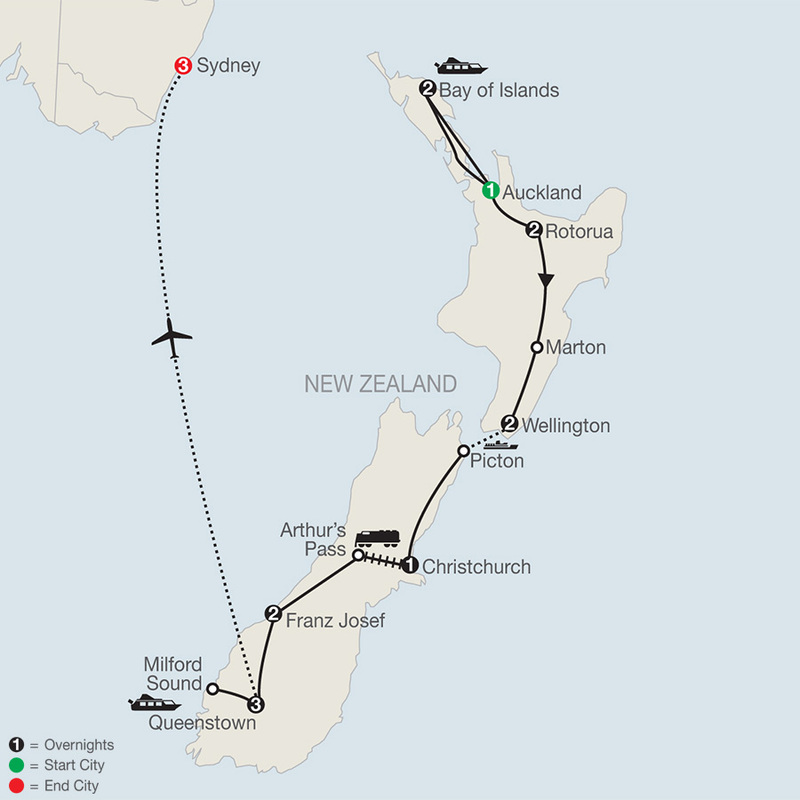 Australia and New Zealand—two countries with breathtaking and unique scenery, as well as vibrant cities. 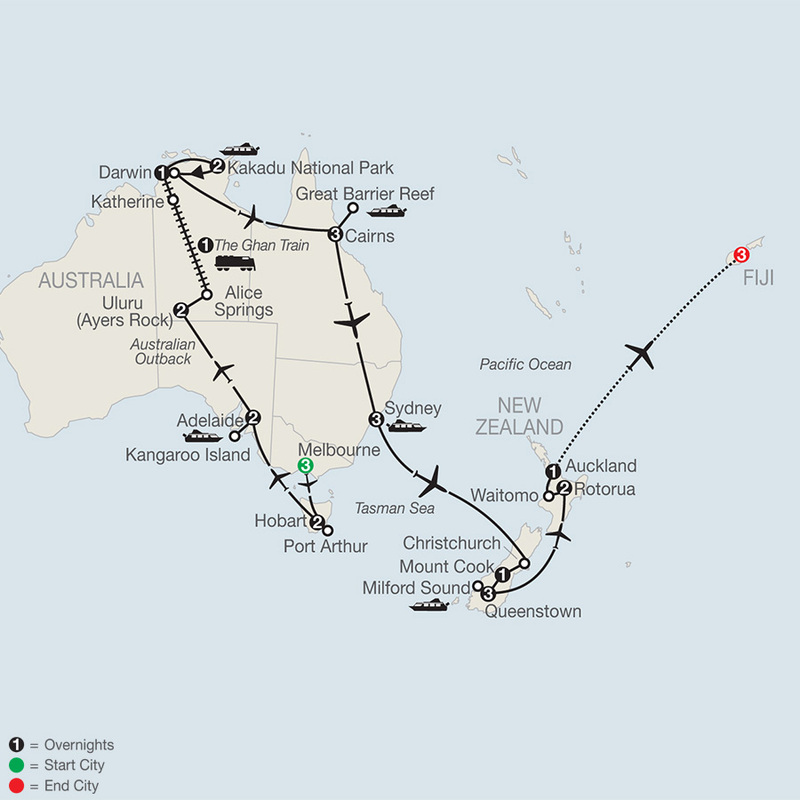 On this Australia and New Zealand tour, you 'll have an opportunity to see Australia 's and New Zealand 's scenic highlights and most popular cities, including Auckland, Queenstown, Melbourne, Cairns, and Sydney. Words simply cannot describe the beauty of the Great Barrier Reef, with its clear, tropical water and explosion of colors. You 'll get to see it in person and even snorkel in it or take a watercraft tour! Similarly, photos do not adequately depict the magnificence and amazing size of Uluru (Ayers Rock) in Australia 's Outback. You must stand before it to get a true perspective of its size and to see the changing colors of the rock at sunset. On this tour, you 'll have that opportunity and you 'll learn about Uluru 's significance to the Aboriginal people. In New Zealand, more breathtaking scenery awaits you at Fiordland National Park, where you 'll cruise on Milford Sound and witness the extraordinary beauty and sheer cliffs. 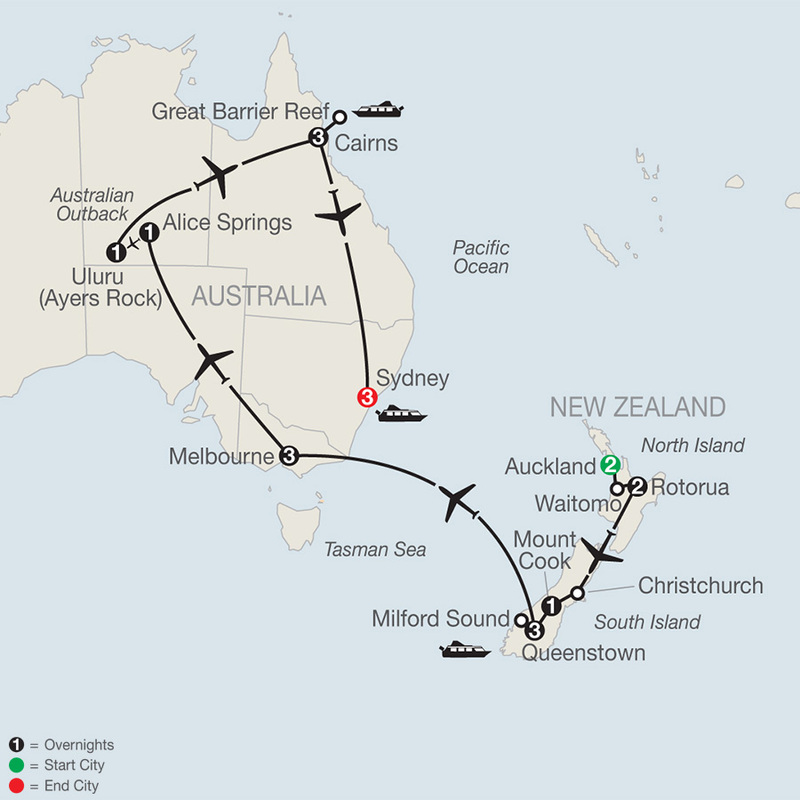 On this Australia and New Zealand tour, you 'll also experience sophisticated, yet laid-back, cities. In Melbourne, soak up the city 's atmosphere and discover its boutiques, cafés, and world-class dining. Globus has also arranged a fun experience for you here…lunch aboard the historic Colonial Tramcar Restaurant. Sydney offers a spectacular harbor; the world-famous Opera House, which you 'll visit during your sightseeing tour; fabulous shopping; and cosmopolitan cuisine. Known for adventure, Queenstown is a marvelous city set in the magnificent landscapes of New Zealand 's Southern Alps. Here, enjoy a cruise on Lake Wakatipu. 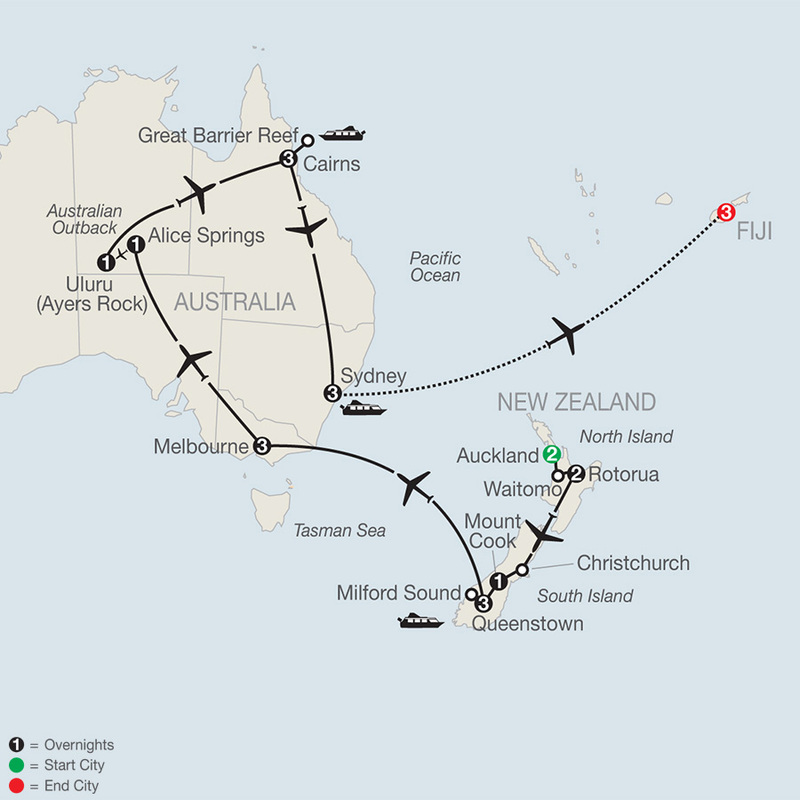 From the sun-scorched desert of the Outback to the tropical Great Barrier Reef and from the smaller destinations in New Zealand to the cosmopolitan cities in Australia, this is a dream vacation!